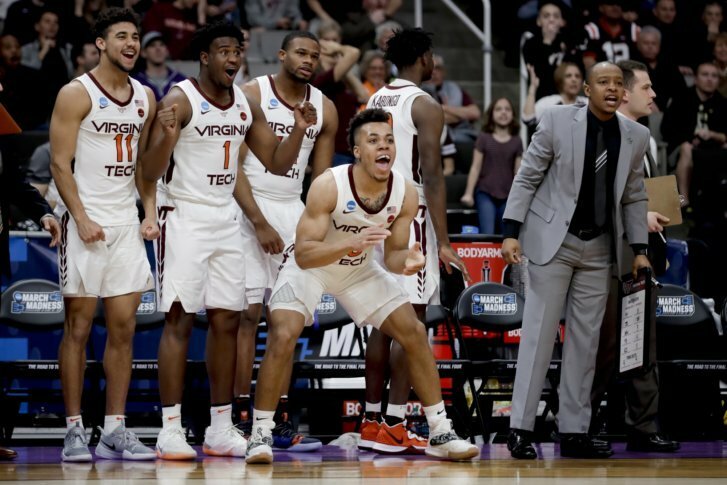 SAN JOSE, Calif. (AP) — After back-to-back years of first-round losses in the NCAA Tournament, Virginia Tech finally broke through. Virginia Tech got a big boost to go along with the lopsided win with the return of star point guard Justin Robinson. The Hokies had been without their floor leader the past 12 games because of an injured left foot but he came in off the bench and scored nine points in 27 minutes as he works his way back into game shape. He got a hug from Williams on the sideline after he came out of the game in the final minute. Javon Bess scored 14 points and D.J. Foreman added 12 for the Billikens (23-13), who lost in their first tournament game since 2014. After three double-digit seeds won to start the day in San Jose, the Hokies wasted little time in imposing their will and making sure there wouldn’t be another upset. They used a 10-0 run early in the first half to open a 13-point lead and didn’t slow down. Virginia Tech built a 40-18 lead at the half, forcing 12 turnovers and allowing the Billikens just one 3-pointer on nine attempts. Saint Louis tried to make it a game with back-to-back 3-pointers from Tramaine Isabell Jr. to cut the deficit to 10 points midway through the second half. But that was as close as the Billikens got the rest of the way. Saint Louis: Coach Travis Ford fell to 1-7 all-time in the NCAA Tournament. He lost the opener in his only trip with Eastern Kentucky in 2005 and then again in his final four trips with Oklahoma State. His only win came in the first round against Tennessee in 2009 before losing to Pittsburgh. Virginia Tech: The Hokies matched a school record with their 25th win and are in position to make a longer tournament run with only 12th-seeded Liberty standing in the way of the school’s first trip to the Sweet Sixteen since making the regional final in 1967. Robinson came into the game with 13:39 to play in the first half. He had a steal that led to a fast-break basket by Hill and then made his first shot he took, a 3-pointer that made it 26-8. He yelled “I’m back!” to the crowd after making that shot. The Hokies won despite making just 4 of 19 shots from the field for the entire second half. Virginia Tech won the game at the line instead, making 17 of 21 free throws. The Hokies will play Liberty in the second round in a rematch of a charity game in November. Virginia Tech won 86-70 in a game that raised money for hurricane relief.